Field Marshal Sir Claude John Eyre Auchinleck, GCB, GCIE, CSI, DSO, OBE (21 June 1884 – 23 March 1981) was a British Army commander during the Second World War. He was a career soldier who spent much of his military career in India, where he rose to become Commander-in-Chief of the Indian Army by early 1941. In July 1941 he was appointed Commander-in-Chief of the Middle East theatre, but after initial successes the war in North Africa turned against the British, and he was relieved of the post in 1942 during the crucial Alamein campaign. In June 1943 he was once again appointed Commander-in-Chief, India, where his support through the organisation of supply, maintenance and training for Slim's Fourteenth Army played an important role in its success. He served as Commander-in-Chief, India until the Partition in 1947, when he assumed the role of Supreme Commander of all British forces in India and Pakistan until late 1948. Born at 89 Victoria Road in Aldershot, the son of Colonel John Claud Alexander Auchinleck and Mary Eleanor (Eyre) Auchinleck, Auchinleck attended Eagle House School at Crowthorne and then Wellington College on scholarships. After attending the Royal Military College, Sandhurst, Auchinleck was commissioned as an unattached second lieutenant in the Indian Army on 21 January 1903 and joined to the 62nd Punjabis in April 1904. He soon learnt several Indian languages and, able to speak fluently with his soldiers, he absorbed a knowledge of local dialects and customs: this familiarity engendered a lasting mutual respect, enhanced by his own personality. He was promoted to lieutenant on 21 April 1905 and then spent the next two years in Tibet and Sikkim before moving to Benares in 1907 where he caught diphtheria. After briefly serving with the Royal Inniskilling Fusiliers at Aldershot he returned to Benares in 1909 and became adjutant of the 62nd Punjabis with promotion to captain on 21 January 1912. Auchinleck was an active freemason. Auchinleck saw active service in the First World War and was deployed with his regiment to defend the Suez Canal: in February 1915 he was in action against the Turks at Ismaïlia. His regiment moved into Aden to counter the Turkish threat there in July 1915. The 6th Indian Division, of which the 62nd Punjabis were a part, was landed at Basra on 31 December 1915 for the Mesopotamian campaign. In July 1916 Auchinleck was promoted acting major and made second in command of his battalion. He took part in a series of fruitless attacks on the Turks at the Battle of Hanna in January 1916 and was one of the few British officers in his regiment to survive these actions. He became acting commanding officer of his battalion in February 1917 and led his regiment at the Second Battle of Kut in February 1917 and the Fall of Baghdad in March 1917. Having been mentioned in despatches and having received the Distinguished Service Order in 1917 for his service in Mesopotamia, he was promoted to the substantive rank of major on 21 January 1918, to temporary lieutenant-colonel on 23 May 1919 and to brevet lieutenant-colonel on 15 November 1919 for his "distinguished service in Southern and Central Kurdistan" on the recommendation of the Commander-in-Chief of the Mesopotamia Expeditionary Force. Auchinleck attended the Staff College, Quetta between 1920 and 1921. He married Jessie Stewart in 1921. Jessie had been born in 1900 in Tacoma, Washington, to Alexander Stewart, head of the Blue Funnel Line that plied the west coast of the United States. When he died about 1919, their mother took her, her twin brother Alan and her younger brother Hepburne back to Bun Rannoch, the family estate at Innerhadden in Perthshire. Holidaying at Grasse on the French Riviera, Auchinleck, who was on leave from India at the time, met Jessie on the tennis courts. She was a high-spirited, blue-eyed beauty. Things moved quickly, and they were married within five months. Sixteen years younger than Auchinleck, Jessie became known as 'the little American girl' in India, but adapted readily to life there. They had no children. Auchinleck became temporary Deputy Assistant Quartermaster-General at Army Headquarters in February 1923 and then second-in-command of his regiment, which in the 1923 reorganisation of the Indian Army had become the 1st battalion, 1st Punjab Regiment, in September 1925. He attended the Imperial Defence College in 1927 and, having been promoted to lieutenant-colonel on 21 January 1929 he was appointed to command his regiment. Promoted to full colonel on 1 February 1930 with seniority from 15 November 1923, he became an instructor at the Staff College, Quetta in February 1930 where he remained until April 1933. He was promoted to temporary brigadier on 1 July 1933 and given command of the Peshawar Brigade, which was active in the pacification of the adjacent tribal areas during the Mohmand and Bajaur Operations between July and October 1933: during his period of command he was mentioned in despatches. He led a second punitive expedition during the Second Mohmand Campaign in August 1935 for which he was again mentioned in despatches, promoted to major-general on 30 November 1935 and appointed a Companion of the Order of the Star of India on 8 May 1936. On leaving his brigade command in April 1936, Auchinleck was on the unemployed list (on half pay) until September 1936 when he was appointed Deputy Chief of the General Staff and Director of Staff Duties in Delhi. He was then appointed to command the Meerut District in India in July 1938. In 1938 Auchinleck was appointed to chair a committee to consider the modernisation, composition and re-equipment of the British Indian Army: the committee's recommendations formed the basis of the 1939 Chatfield Report which outlined the transformation of the Indian Army – it grew from 183,000 in 1939 to over 2,250,000 men by the end of the war. On the outbreak of war Auchinleck was appointed to command the Indian 3rd Infantry Division but in January 1940 was summoned to the United Kingdom to command IV Corps, the only time in the war that a wholly British corps was commanded by an Indian Army officer. He received promotion to acting Lieutenant-General on 1 February 1940 and to the substantive rank of Lieutenant-General on 16 March 1940. In May 1940 Auchinleck took over command of the Anglo-French ground forces in Norway, a military operation that was doomed to fail. After the fall of Norway, in June 1940 he briefly commanded V Corps before becoming General Officer Commanding-in-Chief, Southern Command in July 1940, where he had an uneasy relationship with his subordinate Bernard Montgomery, the new V Corps commander. Montgomery later wrote: "In the 5th Corps I first served under Auchinleck... I cannot recall that we ever agreed on anything." Promoted to full general on 26 December 1940, Auchinleck was recalled to India in January 1941 to become Commander-in-Chief, India in which position he also was appointed to the Executive Council of the Governor-General of India and appointed ADC General to the King which ceremonial position he held until after the end of the War. In April 1941, RAF Habbaniya was threatened by the new pro-Axis regime of Rashid Ali. This large Royal Air Force station was west of Baghdad in Iraq and General Archibald Wavell, Commander-in-Chief Middle East Command, was reluctant to intervene, despite the urgings of Winston Churchill, because of his pressing commitments in the Western Desert and Greece. Auchinleck, however, acted decisively, sending a battalion of the King's Own Royal Regiment by air to Habbaniya and shipping the Indian 10th Infantry Division by sea to Basra. Wavell was prevailed upon by London to send Habforce, a relief column, from the British Mandate of Palestine but by the time it arrived in Habbaniya on 18 May the Anglo-Iraqi War was virtually over. Following the see-saw of Allied and Axis successes and reverses in North Africa, Auchinleck was appointed to succeed General Sir Archibald Wavell as Commander-in-Chief Middle East Command in July 1941; Wavell took up Auchinleck's post as Commander-in-Chief of the Indian Army, swapping jobs with him. As Commander-in-Chief Middle East Auchinleck, based in Cairo, held responsibility not just for North Africa but also for Persia and the Middle East. He launched an offensive in the Western Desert, Operation Crusader, in November 1941: despite some tactical reverses during the fighting which resulted in Auchinleck replacing the Eighth Army commander Alan Cunningham with Neil Ritchie, by the end of December the besieged garrison of Tobruk had been relieved and Rommel obliged to withdraw to El Agheila. Auchinleck appears to have believed that enemy had been defeated, writing on 12 January 1942 that the Axis forces were "beginning to feel the strain" and were "hard pressed". In fact the Axis forces had managed to withdraw in good order and a few days after Auchinleck's optimistic appreciation, having reorganised and been reinforced, struck at the dispersed and weakened British forces, driving them back to the Gazala positions near Tobruk. The British Chief of the Imperial General Staff (CIGS), General Sir Alan Brooke, wrote in his diary that it was "nothing less than bad generalship on the part of Auchinleck. He has been overconfident and has believed everything his overoptimistic [DMI] Shearer has told him". Brooke commented that Auchinleck "could have been one of the finest of commanders" but lacked the ability to select the men to serve him. Brooke sent him one of his best armoured division commanders Richard McCreery, whose advice was ignored in favour of Dorman-Smith's. Major-General John "Jock" Campbell and General Sir Claude Auchinleck, Commander-in-Chief Middle East, in the Western Desert. Rommel's attack at the Battle of Gazala of 26 May 1942 resulted in a significant defeat for the British. Auchinleck's appreciation of the situation written to Ritchie on 20 May had suggested that the armoured reserves be concentrated in a position suitable to meet both a flanking attack around the south of the front or a direct attack through the centre (which was the likelihood more favoured by Auchinleck). In the event, Ritchie chose a more dispersed and rearward positioning of his two armoured divisions and when the attack in the centre came, it proved to be a diversion and the main attack, by Rommel's armoured formations, came round the southern flank. Poor initial positioning and subsequent handling and coordination of Allied formations by Ritchie and his corps commanders resulted in their heavy defeat and the Eighth Army retreating into Egypt; Tobruk fell to the Axis on 21 June 1942. On 24 June Auchinleck stepped in to take direct command of the Eighth Army, having lost confidence in Neil Ritchie's ability to control and direct his forces. Auchinleck discarded Ritchie's plan to stand at Mersa Matruh, deciding to fight only a delaying action there, while withdrawing to the more easily defendable position at El Alamein. Here Auchinleck tailored a defence that took advantage of the terrain and the fresh troops at his disposal, stopping the exhausted German/Italian advance in the First Battle of El Alamein. Enjoying a considerable superiority of material and men over the weak German/Italian forces, Auchinleck organised a series of counter-attacks. Poorly conceived and badly coordinated, these attacks achieved little. Like his foe Rommel (and his predecessor Wavell and successor Montgomery), Auchinleck was subjected to constant political interference, having to weather a barrage of hectoring telegrams and instructions from Prime Minister Churchill throughout late 1941 and the spring and summer of 1942. Churchill constantly sought an offensive from Auchinleck, and was downcast at the military reverses in Egypt and Cyrenaica. Churchill was desperate for some sort of British victory before the planned Allied landings in North Africa, Operation Torch, scheduled for November 1942. He badgered Auchinleck immediately after the Eighth Army had all but exhausted itself after the first battle of El Alamein. 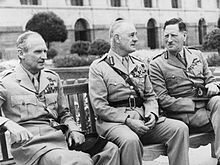 Churchill and the Chief of the Imperial General Staff, Alan Brooke, flew to Cairo in early August 1942, to meet Auchinleck, where it emerged he had lost the confidence of both men. He was replaced as Commander-in-Chief Middle East Command by General Sir Harold Alexander (later Field Marshal Earl Alexander of Tunis). Joseph M. Horodyski and Maurice Remy both praise Auchinleck as an underrated military leader who contributed the most to the successful defence of El Alamein and consequently the final defeat of Rommel in Africa. The two historians also criticize Churchill for the unreasonable decision to put the blame on Auchinleck and to relieve him. It was a good day for us when he [Auchinleck] took command of India, our main base, recruiting area and training ground. The Fourteenth Army, from its birth to its final victory, owed much to his unselfish support and never-failing understanding. Without him and what he and the Army of India did for us we could not have existed, let alone conquered. Auchinleck suffered a personal disappointment when his wife Jessie left him for his friend Air Chief Marshal Sir Richard Peirse. Peirse and Auchinleck had been students together at the Imperial Defence College, but that was long before. Peirse was now Allied Air Commander-in-Chief, South-East Asia, and also based in India. The affair became known to Mountbatten in early 1944, and he passed the information to the Chief of the RAF, Sir Charles Portal, hoping that Peirse would be recalled. The affair was common knowledge by September 1944, and Peirse was neglecting his duties. Mountbatten sent Peirse and Lady Auchinleck back to England on 28 November 1944, where they lived together at a Brighton hotel. Peirse had his marriage dissolved, and Auchinleck obtained a divorce in 1946. Auchinleck was reportedly very badly affected. According to his sister, he was never the same after the break-up. He always carried a photograph of Jessie in his wallet even after the divorce. There is scholarly dispute whether Auchinleck was homosexual. His biographer, Philip Warner, addressed the rumours but dismissed them; however historian Ronald Hyam has alleged that "sexually based moral-revulsion" was the reason for Montgomery's inability to get on with Auchinleck, and further, that Auchinleck was "let off with a high-level warning" over his relationships with Indian boys. Auchinleck continued as Commander-in-Chief of the Indian Army after the end of the war helping, though much against his own convictions, to prepare the future Indian and Pakistani armies for the Partition of India: in November 1945 he was forced to commute the more serious judicial sentences awarded against officers of the Indian National Army in face of growing unease and unrest both within the Indian population, and the British Indian Army. On 1 June 1946 he was promoted to field marshal, but he refused to accept a peerage, lest he be thought associated with a policy (i.e. Partition) that he thought fundamentally dishonourable. Sending a report to British Government on 28 September 1947 Auchinleck wrote: "I have no hesitation, whatever, in affirming that the present Indian Cabinet are implacably determined to do all in their power to prevent the establishment of the Dominion of Pakistan on firm basis." He stated in the second, political part of his assessment, "Since 15th August, the situation has steadily deteriorated and the Indian leaders, cabinet ministers, civil officials and others have persistently tried to obstruct the work of partition of the armed forces." When partition was effected in August 1947, Auchinleck was appointed Supreme Commander of all British forces remaining in India and Pakistan and remained in this role until the winding up and closure of the Supreme H.Q. at the end of November 1948. This marked his effective retirement from the army (although technically field marshals in the British Army never retire, remaining on the active list on half pay). He left India on 1 December. After a brief period in Italy in connection with an unsuccessful business project, Auchinleck retired to London, where he occupied himself with a number of charitable and business interests and became a respectably skilled watercolour painter. In 1960 he settled in Beccles in the county of Suffolk, remaining there for seven years until, at the age of eighty-four, he decided to emigrate and set up home in Marrakesh, where he died on 23 March 1981. Auchinleck was buried in Ben M'Sik European Cemetery, Casablanca, in the Commonwealth War Graves Commission plot in the cemetery, next to the grave of Raymond Steed who was the second youngest non-civilian Commonwealth casualty of the Second World War. A memorial plaque was erected in the crypt of St Paul's Cathedral. The tour guides relate how in 1979, as plaques for the other great Second World War military leaders were being installed, no one in the establishment had been in contact with his family for some years. Cathedral officials telephoned to enquire the date of his death only to be told "Auchinleck here – but I won't be keeping you much longer! "[note 3] A bronze statue of Auchinleck can be seen on Broad Street adjacent to Auchinleck House, Five Ways, Birmingham. ^ Alanbrooke in a footnote to his diary entry of 30 January wrote: "Auchinleck, to my mind, had most of the qualifications to make him one of the finest of commanders, but unfortunately he lacked the most important of all – the ability to select the men to serve him. The selection of Corbett as his Chief of Staff, Dorman-Smith as his chief advisor, and (Eric) Shearer as his head of intelligence service contributed most of all to his downfall"
^ Source of quote, Richard Palmer of St Paul's cathedral. ^ "No. 35559". The London Gazette (Supplement). 12 May 1942. p. 744. ^ a b "No. 36866". The London Gazette (Supplement). 29 December 1944. p. 3. ^ a b "No. 35019". The London Gazette (Supplement). 20 December 1940. p. 7109. ^ a b c "No. 34282". The London Gazette. 8 May 1936. p. 2974. ^ a b c "No. 34066". The London Gazette. 3 July 1934. p. 4227. ^ a b "No. 34282". The London Gazette. 8 May 1936. p. 2979. ^ a b "No. 38359". The London Gazette (Supplement). 20 July 1948. p. 4189. ^ a b "No. 35559". The London Gazette (Supplement). 12 May 1942. p. 2113. ^ a b Montgomery-Massingberd, Hugh (1976). Burke's Irish Family Records. London, U.K.: Burkes Peerage Ltd. p. 331. ^ a b "No. 38240". The London Gazette (Supplement). 16 March 1948. p. 1919. ^ a b "No. 36103". The London Gazette (Supplement). 20 July 1943. p. 3319. ^ a b Qureshi, Maj MI. (1958). The First Punjabis: History of the First Punjab Regiment 1759–1956. Aldershot: Gale & Polden. ^ "No. 35153". The London Gazette (Supplement). 2 May 1941. p. 2571. ^ "No. 34649". The London Gazette. 28 July 1939. p. 5218. ^ "No. 36532". The London Gazette. 26 May 1944. p. 2443. ^ "No. 27517". The London Gazette. 20 January 1903. p. 390. ^ "No. 28376". The London Gazette. 24 May 1910. p. 3640. ^ "No. 28590". The London Gazette. 15 March 1912. p. 1922. ^ "Famous Freemasons". Blackpool Group of Lodges and Chapters. 10 December 2015. ^ "No. 30138". The London Gazette. 19 June 1917. p. 6058. ^ "No. 31123". The London Gazette. 14 January 1919. p. 719. ^ "No. 32084". The London Gazette. 14 October 1920. p. 9968. ^ "No. 31777". The London Gazette (Supplement). 10 February 1920. p. 1802. ^ "Claude Auchinleck". The Spokesman-Review: 1. 8 July 1941. ^ By J. Y. Smith (25 March 1981). "Sir Claude Auchinleck, 96, Dies". The Washington Post. Retrieved 10 February 2019. ^ "No. 33475". The London Gazette. 8 March 1929. p. 1678. ^ "No. 33600". The London Gazette. 25 April 1930. p. 2596. ^ "No. 33604". The London Gazette. 9 May 1930. p. 2870. ^ "No. 33952". The London Gazette. 23 June 1933. p. 4206. ^ "No. 33976". The London Gazette. 8 September 1933. p. 5864. ^ "No. 34239". The London Gazette. 3 January 1936. p. 53. ^ "No. 34275". The London Gazette. 17 April 1936. p. 2490. ^ "No. 34338". The London Gazette. 6 November 1936. p. 7127. ^ "No. 34536". The London Gazette. 29 July 1938. p. 4884. ^ "No. 34811". The London Gazette (Supplement). 15 March 1940. p. 1531. ^ "No. 34902". The London Gazette (Supplement). 19 July 1940. p. 4493. ^ "No. 35023". The London Gazette (Supplement). 27 December 1940. p. 7251. ^ "No. 35037". The London Gazette. 7 January 1941. p. 158. ^ "No. 37875". The London Gazette. 7 February 1947. p. 662. ^ "No. 35218". The London Gazette (Supplement). 11 July 1941. p. 4048. ^ "No. 35247". The London Gazette. 15 August 1941. p. 4740. ^ Horodyski, Joseph M. (23 September 2016). "Sir Claude Auchinleck: Overshadowed Equal to Erwin Rommel". 2016 Sovereign Media. Retrieved 27 September 2016. ^ Remy 2002, p. 107. ^ "No. 38177". The London Gazette (Supplement). 15 January 1948. pp. 398–400. ^ "No. 36133". The London Gazette. 13 August 1943. p. 3653. ^ Warner 1982, p. 262. ^ "No. 37586". The London Gazette (Supplement). 28 May 1946. p. 2617. ^ "No. 37586". The London Gazette (Supplement). 31 May 1946. p. 2617. ^ Warner 1982, p. 301. ^ "Cemetery details—Ben M'Sik European Cemetery". Commonwealth War Graves Commission. Retrieved 22 April 2009. ^ "Auchinleck statue to get prime position in Birmingham Five Ways shopping centre plan". Birmingham Post. 1 March 2012. Retrieved 9 November 2017. ^ "No. 34066". The London Gazette. 3 July 1934. p. 4222. ^ Ishwari Prasad. "The Life and Times of Maharaja Juddha Shumsher Jung Bahadur Rana of Nepal p.277". APH Publishing. Retrieved 22 May 2018. Alanbrooke, Field Marshal Lord (2001). Danchev, Alex; Todman, Daniel, eds. War Diaries 1939–1945. Phoenix Press. ISBN 1-84212-526-5. Bajwa, Kuldip Singh (2003). Jammu and Kashmir War, 1947-1948: Political and Military Perspective. Har-Anand Publications, New Delhi. ISBN 978-8124109236. Barr, Niall (2005). Pendulum Of War: Three Battles at El Alamein. Pimlico. ISBN 978-0712668279. Bond, Brian; Tachikawa, Kyoichi, eds. (2004). British and Japanese Military Leadership in the Far Eastern War, 1941–1945. London & New York: Frank Cass. ISBN 9780714656595. Mackenzie, Compton (1951). Eastern Epic. Chatto & Windus, London. ASIN B0011DPGZ4. Montgomery, Bernard (2005). The Memoirs of Field Marshal Montgomery. Leo Cooper Ltd. ISBN 978-1844153305. Nawaz, Shija (2009). Crossed Swords: Pakistan, its Army, and the Wars Within. Oxford University Press. ISBN 978-0195476972. Playfair, Major-General I.S.O. ; with Flynn, Captain F.C. (R.N. ); Molony, Brigadier C.J.C. & Gleave, Group Captain T.P. (2004) [1st. pub. HMSO:1960]. Butler, Sir James, ed. The Mediterranean and Middle East, Volume III: British Fortunes reach their Lowest Ebb (September 1941 to September 1942). History of the Second World War, United Kingdom Military Series. Uckfield, UK: Naval & Military Press. ISBN 1-84574-067-X. Stewart, Adrian (2010). The Early Battle of Eighth Army: crusader to the Alamein Line 1941–1942. Stackpole Books. ISBN 978-0811735360. Slim, Field Marshal Viscount (1972) . Defeat into Victory. London: Cassell. ISBN 0-304-29114-5. Warner, Philip (1982) . Auchinleck. The Lonely Soldier. London: Sphere Books. ISBN 0-7221-8905-2. Warner, Philip (1991). Keegan, John, ed. Churchill's Generals. London: Cassell Military. ISBN 0-304-36712-5. Woodburn Kirby, Major-General S. (2004) [1st. pub. HMSO:1961]. Butler, Sir James, ed. The War Against Japan, Volume III: The Decisive Battles. History of the Second World War, United Kingdom Military Series. Uckfield, UK: Naval & Military Press. ISBN 1-84574-062-9. Agar-Hamilton, J.A.I. (1952). Crisis In The Desert May–July 1942. Cape Town: Oxford University Press. ASIN B0015ZSSW6. Ammentorp, Steen. "Generals of World War II". Retrieved 28 September 2007. Houterman, Hans; Koppes, Jeroen. "World War II unit histories and officers". Retrieved 28 September 2007. Wikimedia Commons has media related to Claude Auchinleck. "Archival material relating to Claude Auchinleck". UK National Archives.